Pari kivaa boulderia kahvojen välissä. Tackar pojjaat. A very impressive line which follows a crack up its first half and then continues onto the face as the crack comes to an end. Thin and technical, with a distinct crux whose end is marked by a jug. After his successful toprope without weighting the rope, Kurt was awarded a bottle of wine with dancing pigs on the label. Thus, the inspiration for the route's name. The second toprope ascent went to John Bachar, and the first redpoint was done by Wolfgang Güllich. Additionally, from a story in "Fight Gravity" by Kurt Albert, Jerry Moffatt came for several visits to the Frankenjura and made friends with the climbers here. During a visit in 1983, he was shown this relatively new addition to the Frankenjura hard-route scene. He had been onsighting everything else they were showing him and, sick of it, Kurt lowered down and rubbed something slippery or gooey in the crux hold. When Jerry got on it, he climbed up to that part, grabbed the hold, screamed down something like, "You assholes! ", grabbed another hold and finished his onsight. Eka sturtsi piissiin ikinä saittiyrkällä. Tais kuitenkin olla vähän softi 7-. Tämäkin hieno. Alun olis voinu kiivetä direktimmin. Aivan mahtava, tässä radassa on kaikkea. bolted by Juha H. nice! Still not sure about the name. Short and bouldery, 2 harder moves. 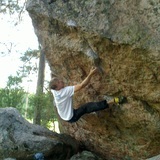 Nice bouldery start, runout finnish. Coolnesss!! Pumpy face climbing, strong traverse, and technical slab! 3rd go. Hardest 7a sofar. So nice!! 3th go. 2 hard cruxes. My first 7c. 3rd go. Route with big jugs on the left side of the crag. Crimpy gently overhanging climb, hard for shorties. Awesome! 300 meters of fear. Epic in the dark.